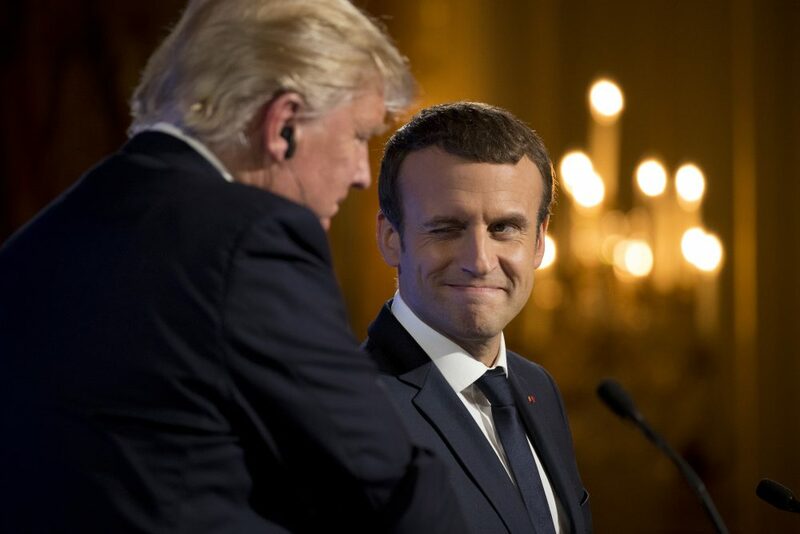 French President Emmanuel Macron winks at President Donald Trump during a joint news conference at the Elysee Palace in Paris, July 13, 2017. Photo by Carolyn Kaster/Associated Press. In particular, the notable victory of Emmanuel Macron in France led many to conclude that the populist tide had turned. Exceeding all expectations, the young centrist not only claimed the French presidency, but also managed to secure a parliamentary majority in the legislative elections on June 18. While his success is remarkable by any measure, there is little reason for anti-populists to celebrate, as it is possible that Macron’s triumph may end up fuelling more populism. For starters, it’s important not to exaggerate popular enthusiasm for a Macron presidency. His support base during the presidential elections grew primarily out of opposition to Le Pen. According to an Ipsos poll, more than 40 percent of the people who voted for Macron in the second round did so in opposition to the far-right leader. Second, Macron’s triumph during the parliamentary elections, which was widely described as a “landslide victory,” was tempered by low voter turnout. In the second round of the two-round legislative elections, fewer than 45 percent of registered voters showed up at the polls—a record low in the history of the Fifth Republic. While there are different ways of interpreting dwindling participation, the high rates of abstention (coupled with spoiled ballots and unregistered voters) suggest that popular support for Macron’s movement may be less strong than it seems. Third, it is easy to forget that Marine Le Pen secured 10.6 million votes for her right-wing populist Front National (FN) party, thereby nearly doubling the number of votes her father, Jean-Marie Le Pen, won in 2002. This means that even though she was defeated in the decisive round of the elections, about one in three French voters backed Le Pen. As Harvard’s Yascha Mounk has pointed out, populist candidates fared particularly well among the young; in the first round of the Présidentielle, half of the voters between the ages of 18 to 24 supported either Marine Le Pen or the far-leftist candidate Jean-Luc Mélenchon, while just one in five of the voters over age 70 did. These young voters are not going to go away anytime soon. In general, when parties from different ideological traditions converge at the center to govern together, it frees up space at the political extremities. On the one hand, the fate of French populism depends on whether the Front National can re-mobilize lingering populist sentiment. To do so, the party will need to overcome internal turmoil and reinvent itself. On the other hand, it hinges on the success of Emmanuel Macron. Unless the French President manages to address the underlying causes that fueled populism, these tendencies are likely to resurface. It’s also doubtful that Macron’s brand of centrism can present a lasting antidote to populism. Similar to Barack Obama in 2008, the newly-elected French President ran on a platform of optimism that promised hope and progress in the guise of political reform. In the United States, Obama’s hopeful vision was followed by popular disillusionment that helped pave the way for Donald Trump. Macron’s strand of centrism is perhaps best described by what the American critical theorist Nancy Fraser has dubbed “progressive neoliberalism” in that it conflates “truncated forms of emancipation and lethal forms of financialization.” In other words, his agenda combines a socially progressive vision and economically neoliberal policies. Indeed, Macron has sought to appeal to voters from both sides of the political spectrum by proposing a combination of liberal and social reforms, and—perhaps more importantly—by insisting that he is both right and left (“et droite, et gauche”). This “middle of the road” strategy comes with the risk of pleasing neither and upsetting both camps. It could even further stoke populism. In Western Europe, some of the strongest populist movements emerged in countries with centrist coalition governments. In the Netherlands for instance, the anti-Muslim populist Pim Fortuyn rose to fame in the early 2000s after eight years of “purple” coalition governments between social democrats and liberals. In general, when parties from different ideological traditions converge at the center to govern together, it frees up space at the political extremities. It also forces parties to agree on a lowest common denominator, which often disillusions voters who feel that they are not being offered a real choice. Of course, the French political context is different in that it operates under a majoritarian voting system, which generally favors bigger parties, rather than a parliamentary one, which produces smaller parties and thus makes coalition governments more likely. But these systemic differences haven’t spared France from the consequences of centrism. For evidence, look no further than Le Pen’s father, Jean-Marie, who was able to advance to the second round in the 2002 presidential elections after half a decade of cohabitation featuring a conservative president and a socialist prime minister. The mushy coalition policies that grew out of this time played their part in generating a political backlash. Macron’s centrism could have a similarly galvanizing effect in that he may end up stoking populism by alienating the hard left as well as the far right, who, after all, represent a sizeable portion of the electorate. The hopes and expectations for Macron’s presidency are sky high. Macron’s success depends on whether he can implement his ambitious agenda. This will prove challenging—not in the least because he is backed by an inexperienced parliament composed of many political novices. And even if he pushes through legislation, it’s possible his reforms will simply end up reinforcing the status quo. Although he managed to present himself as an outsider, it’s worth remembering that he served as economy minister under his predecessor, François Hollande, for two years. But if he finds a way to succeed, it wouldn’t be the first time that Macron has surprised. Indeed, if there is anything we can conclude from these past years, it is that electoral politics in Western democracies have become more volatile and less predictable. Léonie de Jonge is a Ph.D. candidate in Politics & International Studies at the University of Cambridge. Her research focuses on right-wing populist parties in Western Europe.